When my mother passed away suddenly a few years ago, I was just finishing a post-graduate fellowship at the University of Michigan, where I’d completed my MFA. I had no idea what I was going to do next, so I thought I’d go home to Blind Bay, B.C. and spend the summer with my father. Now, almost two years later, I’m still here! It’s strange to move home as an adult. While it was my home, it wasn’t my house, and I felt like I should store all my belongings, all of myself, in my small bedroom. The room had a wall of floor to ceiling windows with sheer curtains, a sliding glass door that opened to a balcony, and a flimsy desk nestled in a corner. I enjoyed writing there with the door closed, especially on bright mornings, but it wasn’t long before I felt like I needed more space. Down the hall, there’s a media room that was once used as a storage space/spare bedroom. One day, I cleared it out, painted the walls, and hung a curtain rod for privacy. My father was glad to give me the space to use, considering that I had settled into being home again, and neither of us knew when I was going to leave. I was in limbo, and every time I thought I had made up my mind about where to move or what to pursue next, I would wake up the next day without a clue. 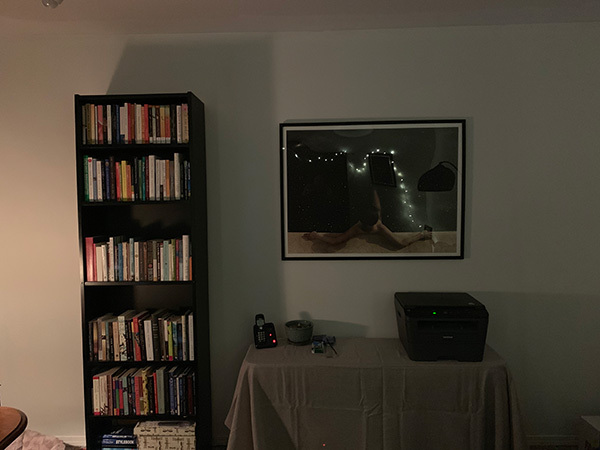 At first, my office had only a desk (that was really a kitchen table I’d found at a thrift store), a bookcase, and a table for my printer. But over the last year I’ve added some artwork (moon phases, witchy water colours, and ethereal prints), a futon, a reading lamp, another bookcase, and some small items that make the space feel like mine (candles, a witch’s hat lamp that I found at a thrift store in Michigan, a snow globe with a haunted house inside). 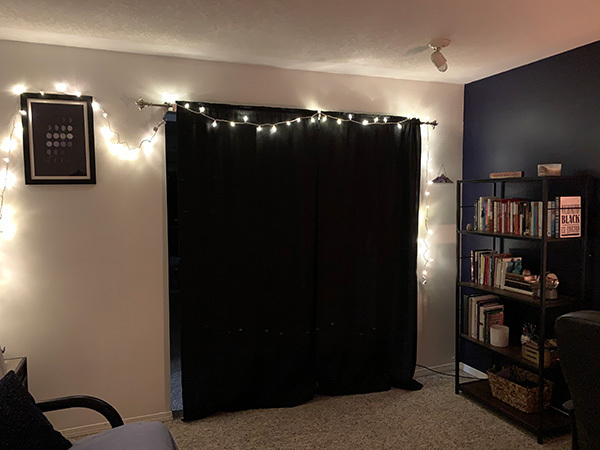 I hung a strand of lights from the curtain rod, bought an hourglass for my desk, and arranged my books (except for my collections of poetry, which still live in my bedroom). The office doesn’t have any windows, which suits my preference for writing at night in low, warm light. 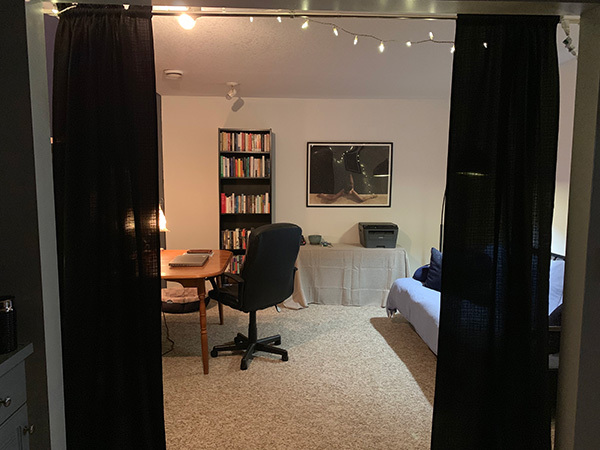 The room feels cavernous at night, and I like that I can drift between writing at my desk, to reading on my futon, and back again. It’s also a great space for daydreaming. It took nearly two years to carve out my own space in this house, a home without my mother. My office finally feels exactly right—just in time for my decision to move back to Victoria, B.C.. 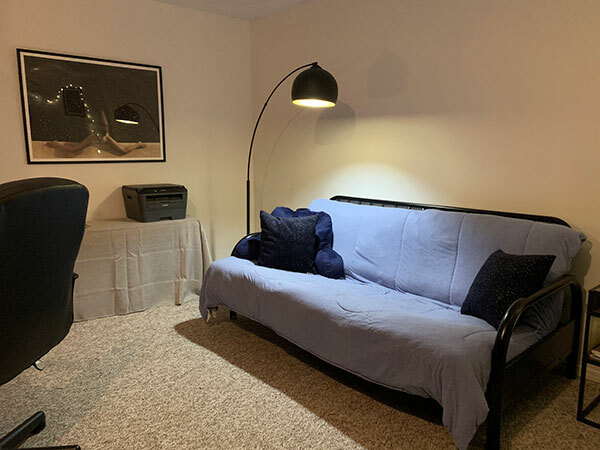 Almost everything in this space will move with me, and this office will likely turn back into the funny little storage space/spare bedroom it was previously. But I’m grateful to this space, and for these last few years. I finished my first collection of poetry in this room. I stepped away from my life while I grieved my mother’s death. I got to know my father better; we got to know each other as adults. I also learned that it doesn’t really matter where you write or what your space looks like. Somehow, the poems get written anyway. And then everything is perfect. And then you leave and start all over again.